Beat Your Competitors with Our Cost-Effective Mobile Apps. Make More Money with Low Investment. PNJ Sharptech computing services are one of the most successful mobile app development services in India. We having mastery and specialization in developing mobile applications for small, mid-sized and largest business houses of different categories. Having a proven record of giving a quick push to business into a success, we have knowledge and smartness to use advanced mobile technology to develop the best mobile apps at the affordable rates. Our highly knowledgeable and rich experienced mobile developers understand the unique prerequisites of the clienteles and come up with the feasible app solutions to match. We cater to excellent IOS and Android mobile applications that are made using advanced applications. While crafting mobile apps, we follow the latest and up to date mobile app technologies and tools. We excel in enhancing user interface to user experience and performance. Whether you are an aspirant start-up or an established brand, you can rely on us to deliver expert mobile app development services for building the most interactive and personalized mobile experiences for your clientele. Our procedure of Mobile Application Development includes a quality guarantee, safety, testing, integration, and uninterrupted continuing management of content, and specified engineering capabilities across the platforms. We have mastery in designing and developing the apps that are simple, unique, high performance, interactive and easy to download. Over a short period of time, we have developed money-making apps for various types of business people. Our app developers have depth knowledge and rich experience to deliver the latest, easy and high-performance apps that suit your business needs perfectly. Our effective methodology of custom app development is the outstanding, unique and affordable. The first step is the strategy formulation that builds the base of designing and building the application. Over many years of experience into the mobile app arena, we have built nearly 100 + mobile apps successfully. We have a list of 100+ happy customers, who have got the success in their business within a few days. 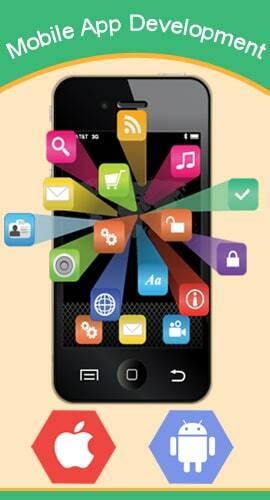 Our aim is to make your business successful with our Custom Mobile App Development technology. It encompasses app development for iPad & iPhone. Our knowledgeable designing team refines your new app concept for designing an engaging user experience. Our app developers have the mastery of creating advanced apps that are capable of reaching your global clients. Our app development team uses advanced technologies, software and app capabilities and app analytics to provide cost-effective app solutions. Our android developers have the proficiency and knowledge in NFC integration, android media APIs, OpenGL, 3D graphics, and Android security architecture. Our android development team develops robust and safe apps for e-commerce, entertainment, sports, travel and many more. We discover the reliability and myriad features of windows for the benefit of the users and build customized mobile applications that are perfectly suited to the customer’s business necessities. Our windows developers are very experienced in using the latest and up to date trends in the industry. We build cross-platform mobile apps with the most prevalent framework, Phone Gap. We create applications depending upon a single code base but compatible for different platforms like Android, IOS and windows so that your trade is able to reach a wide range of audience using various mobile devices. We concentrate on crafting UX designs and interaction and offer you with an eye-catching yet practical and instinctive design to guarantee that the most incomparable experiences for the app users. We improve your app distribution just by improving its search ranking in the App store with the perfect approaches. Get started with us for your app optimization today.